Seaford Town Council as one of its main strategic objectives is aiming to increase the profile of the Town and its amazing assets to encourage more visitors to frequent local businesses. This became a key strategy when the Council learnt that many Town Centre businesses relied on visitors for survival. Keeping a vibrant Town Centre is a vital facility for the town which itself has many great assets such as Sussex’s largest independent toy shop and an array of excellent cafes including a 2nd World War retro cafe. The Town Council has been able gain publicity in a number of ways in the past 12 months including encouraging two feature films to film in the Town and gaining publicity in Sussex wide publications such as hotel brochures and local and even national newspapers. The latest such venture was the publication of features about Seaford in Sussex Style and Town and County Magazines. These included following Town Mayor, Linda Wallraven and the High Sheriff of Sussex for a day around Seaford. 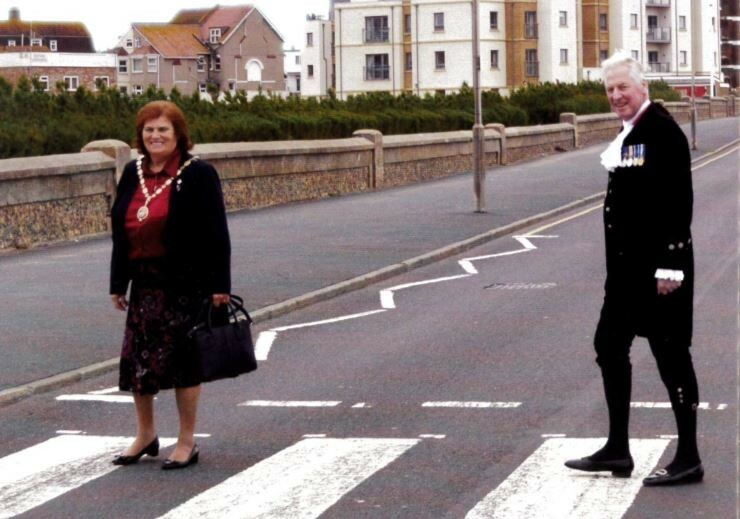 Mayor Linda Wallraven had the pleasure of hosting Major General John Moore-Bick, the High Sheriff of East Sussex, and his wife Anne for a tour around Seaford. This unique day saw an exciting opportunity to promote the cultural and economic wellbeing of the town by being chosen by Sussex Style Magazine for a feature in their latest edition. Linda started the tour at the Old Town Hall for a hot drink before continuing to the first stop which was St Andrew’s Church in Bishopstone Village. This was then followed by a visit to the new beach huts, the Salts Recreation Ground, the Martello Tower, The Shoal; and to finish the morning off in style, a well needed lunch at The View. The afternoon commenced with a drive up to South Hill Barn then on to the Seaford War Memorial, Seaford Cemetery; and to complete the full packed day, they visited The Crouch Gardens. Major General John Moore-Bick said “What a wonderful day you prepared for us in Seaford. Thank you so much! You showed us just why so many people that we meet are so enthusiastic about their town and that you really do make the best of your seaside dimension”. As a thank you the High Sheriff donated £50 to each of the Mayor’s chosen charities; Teddy Treats and Seaford Museum & Heritage Society, which both were extremely grateful for the donation. The article in Sussex Style Magazine can be found on page 10 of issue 62, copies of which are available at The View and at The Tourist Information Offices. Councillor Wallraven visited the Council offices recently to view the complimentary magazines for herself.